Hey there all you prospective test takers (I mean you, high school students)! I thought I'd take the time to let you know about the amazing Kaplan workshops we still have coming up at the Library. Don't forget to REGISTER ONLINE, BY PHONE, or IN PERSON!! First, on Wednesday September 19, we have Accepted: Getting into your First Choice School. 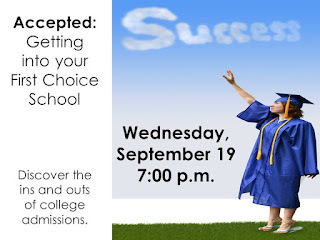 Overwhelmed with college choices? Worried about getting into your first choice? This program will help you discover the ins and outs of college admissions and help you create a plan of attack. Again, both parents and students are welcome. 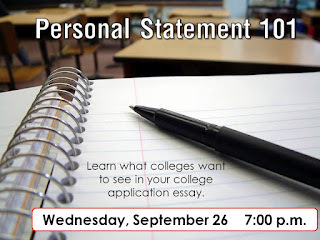 All workshops are from 7:00 to 8:00 p.m., and all workshops welcome both parents and students. Click HERE to register online for the workshop now!